What is correct name for highway grass, and the best chemical to kill it? 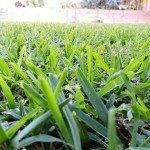 There are several grasses that are referred to as highway grass, such as buffalo grass and bahia grass. If it is getting into your flower beds, a simple grass specific herbicide will kill it without harming your plants. If it is getting into your lawn, then you need to dig out the clumps. There is no selective herbicide that will kill highway grass without killing your lawn grass.